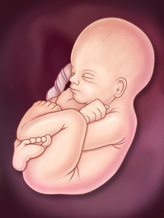 The head-to-bottom length at 30 weeks is about 33cm. The baby is growing plumper so the skin, which was quite wrinkled before, is now smoother. Both the white, greasy vernix and the soft, furry lanugo begin to disappear. By about 32 weeks the baby is usually lying downwards, ready for birth.